Well dear readers, it has arrived. The last of the beautiful vintage garments from Elise. 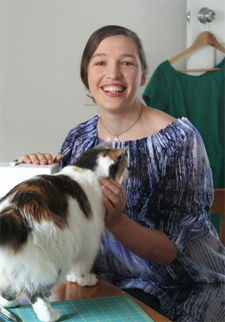 I started this series with one of the most spectacular garments, the assuit tunic. 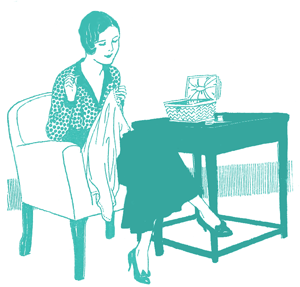 I’m finishing it with an equally spectacular garment, but in a completely different way. How do you like this sweet floral and organza afternoon frock? Isn’t it darling? Isn’t it just gorgeous? And you haven’t even seen how clever and cunning all the sewing details are! 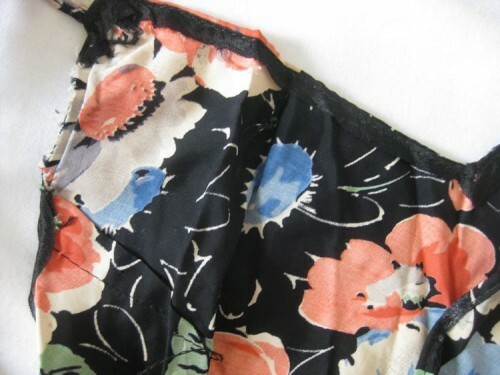 The underslip fabric is rayon, and is such a typically 1930s print: the limited colour-scheme of pastel primaries, the non-directional print, the painterly florals that are recognisable, but not realistic. The cut of the slip is clever but simple, relying on the bias and some basic bust-darts for shaping. The cut is also quite timeless. 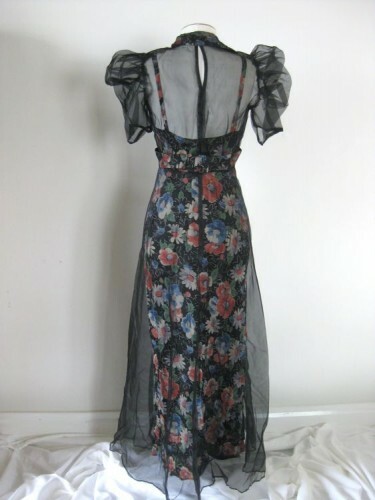 If I found this in an op-shop today I’d have to really look at it to be sure if it was made in the 1930s, or the 1990s. 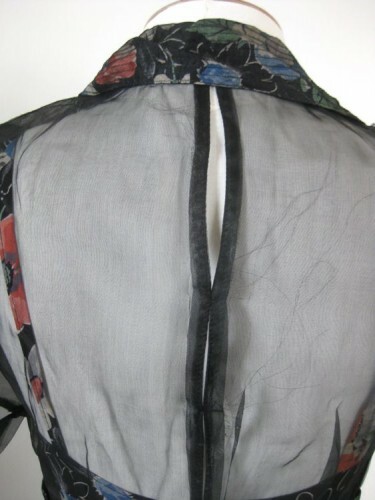 Under-bust seam - very 1930s! While the slip may be simple, and the silhouette of the overdress classicly of its time, the details that make the dress are just exceptionally clever. 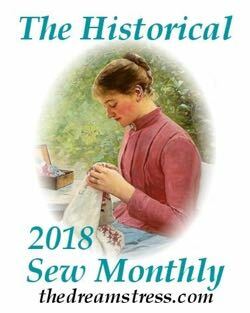 Everything has been thought out, from the way the overdress mutes and frosts the slip, to the double-fabric covered buttons ( Do you know how hard it is to do double fabric buttons?! Hard. 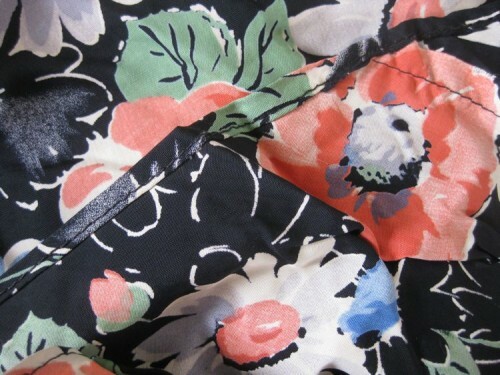 ), to the seaming on the collar – also classically 1930s, but so unusual in its placement and execution. One of the many clever design elements of the dress is the back, with the slip’s low back, and then the rest of the back veiled by the organza, with little peak-a-boo openings. Such a cunning way to carry the fashionably low-back of 1930s eveningwear into daywear. Both the slip and the overdress are beautifully finished in most ways, with a few places where the seamstress skipped finishes because they would never be seen, and wouldn’t matter . The whole dress carries the mark of a busy and experienced sewer (professional or not) who has learned which corners can be cut, and which can’t! 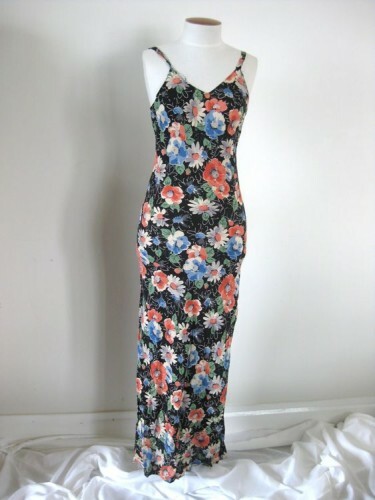 Overall the dress is in exceptionally good condition. 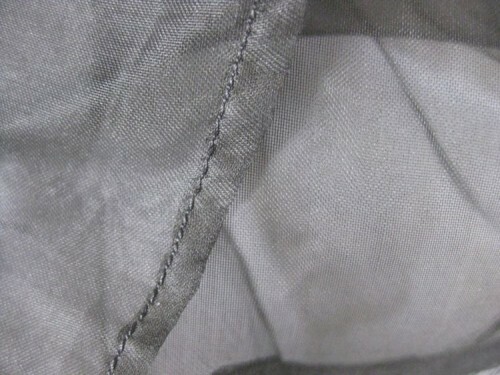 The organza is a bit creased, but the fabric is quite robust. Except in one place. The back belt, as clever as it is, is just too weighty for the thin organza fabric, and is ripping holes in the side seams. Still, the dress is in pretty good nick, and is pretty darling! I’ll certainly be using it as inspiration for a replica, and maybe be wearing it for a photoshoot! I love it SO much!! Those sleeves are magnificent!! Wow, that is one breathtakingly spectacular dress! I love it so much! I’d totally wear it as is. Beautiful. 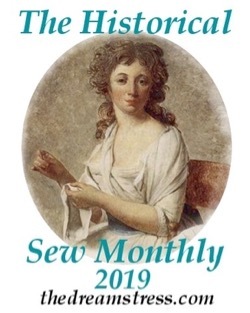 If I were any better at draping and making my own patterns, I’d definitely try to recreate this. 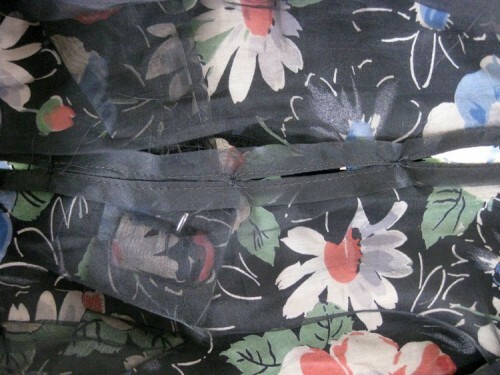 I actually made a summer dress (non-vintage) last summer with a similar fabric combination: a floral cotton print overlaid with sheer black cotton voile. 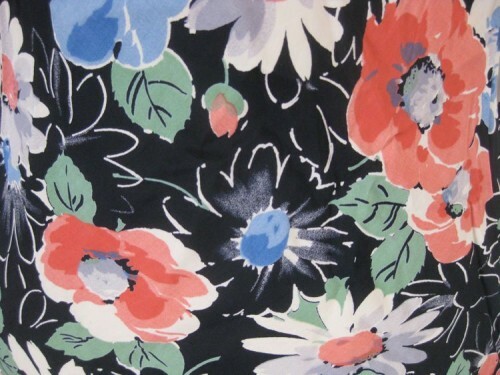 I think it’s a great way to tone down particularly bold florals. Wow that is an amazing dress – so much thought has gone into it. I love the collar details. 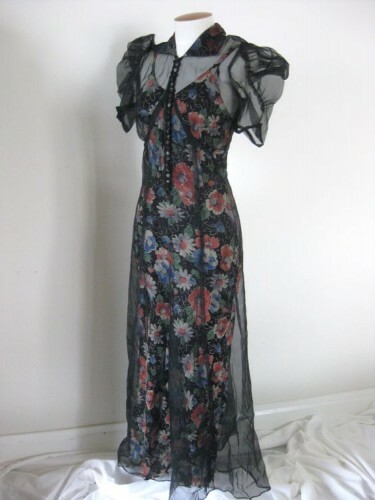 Makes me want to buy one of those amazing 30’s gown patterns and have a go at something similar! That’s a lovely dress. And what a great idea. 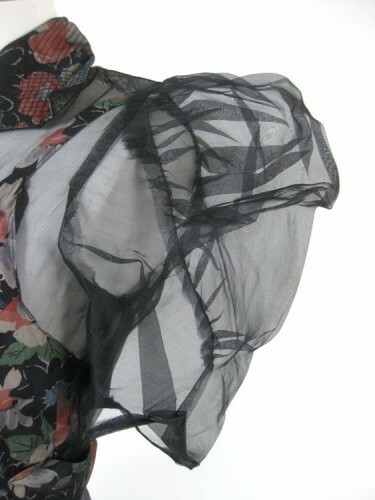 You could wear the slip as a ‘day’ dress then put on the organza overdress ad it suddenly becomes evening wear. This is absolutely gorgeous. I do love vibrant florals against deep, dark (or very pale) backgrounds. Wow! 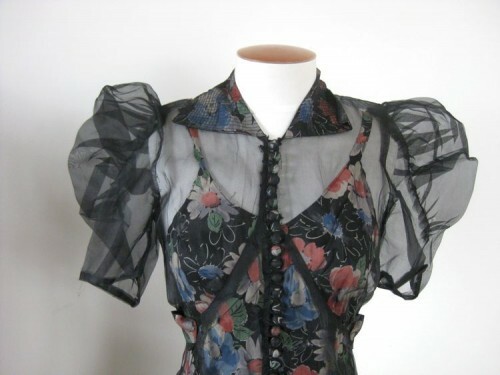 I love how the sleeves are puffed out! I remember looking at them flat, and marveling at their construction and gathering. Thank you so much for pointing out all of the cool details that went into this dress combination! And thank you again, Dreamstress, for being so gracious. I am so so glad that these items found a happy home and a new life with you! Oh please wear it for a photo shoot! I desperately want to see it on the body. This is the reason why I love 30’s fashion! I adore those underbust inverted V’s in 1930s dresses, but I don’t think I’m ready to tackle one yet…that bias cut slip, though, hmm. Thanks for sharing all these pictures from your Elise collection! It’s so nice of you to take the time and document it for the rest of us to ooh and ahh over! I like the underslip much better than the dress with the black organza overdress, but it’s a fascinating garment! I love this! So many good details on a simple-seeming outfit. How does the collar work? 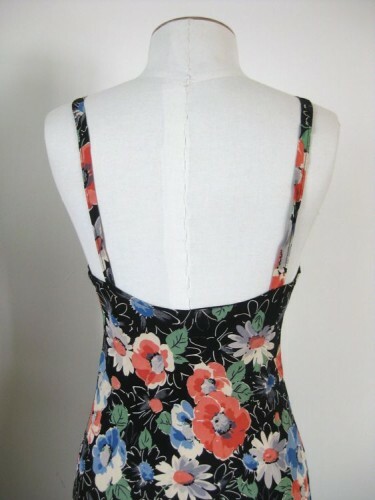 The back is open – is this just a cute ‘gap’? Most impressed by the double covered buttons (shudder! – so hard, so many!) 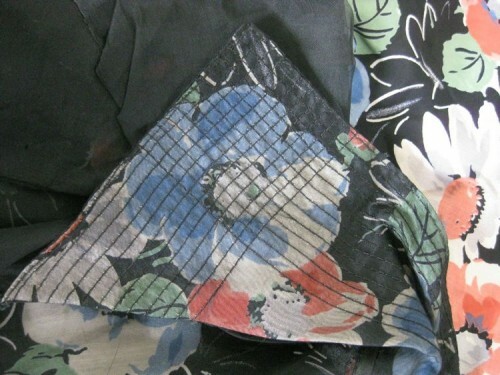 and the stitching on the collar – perfect! Fantastic! 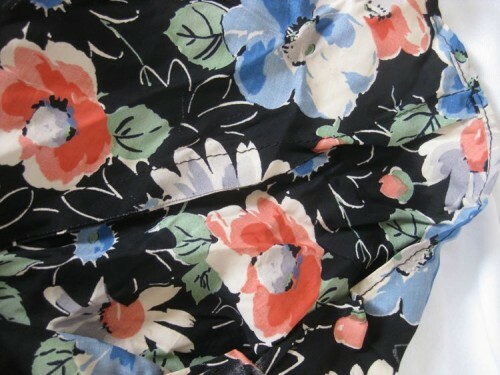 I love the black over the florals – over the colours. And those sleeves are so very clever. – We were looking through those 1930s magazines I have borrowed with my sister recently, and wondering about all those clever and weird construction and embelishment details they came up with in that era – it was all so very exotic. 1940s, compared to that, are extremely modern. What exactly are double-fabric covered buttons? 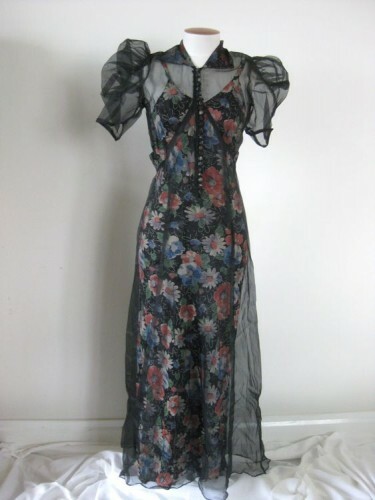 Does it simply mean it’s covered with both the floral and the organza, or is it some sort of special term? 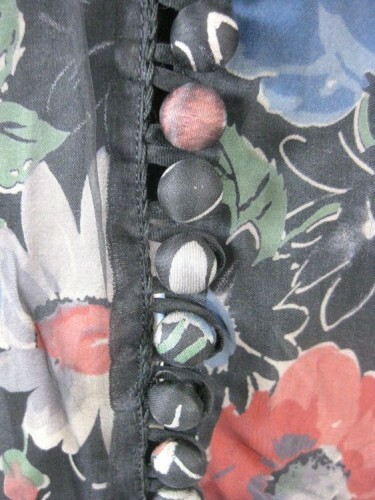 Double fabric covered buttons simply means it is covered in two layers of fabric. Nothing special! 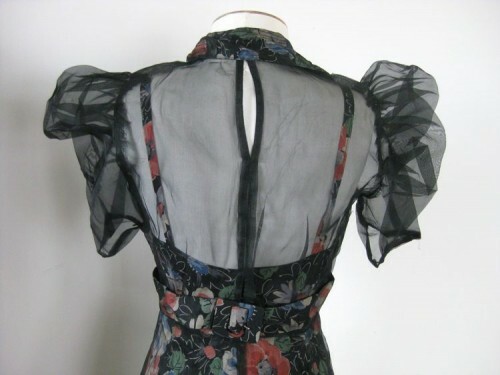 This whole idea of a patterned petticoat with a sheer overlay dress was extremely fashionable about 1937, exactly the time it seems this dress was made. I have seen patterns with this look illustrated. I’m sure McCall had one that I’ll have to see if I can find. 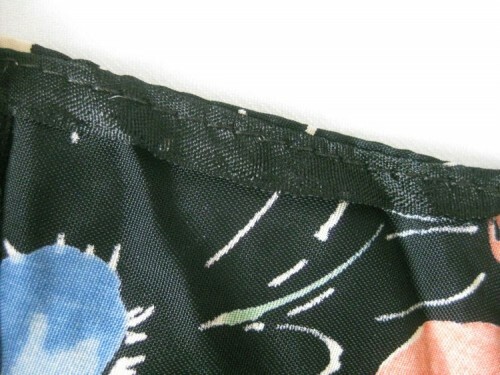 Previous PostTerminology: What is alamode or allamode fabric?